It's possible to glue thin styrene strips to the top of modern containers so the Tyco container crane can grab them. Some minor painting to blend them in is required. Keeps the grandkid's happy when they get to use "their" container cars. I also got a TYCO Durango-style stock car. On this one, I used E-Z Mate Mark II couplers. Another TYCO Santa Fe boxcar, this time the red El Capitan 50-foot car. Another long-distance Amtrak passenger train of sorts; this one I kind of based off the 1954 Encyclopedia Britannica documentary film "The Passenger Train." A Model Power railroad signal. 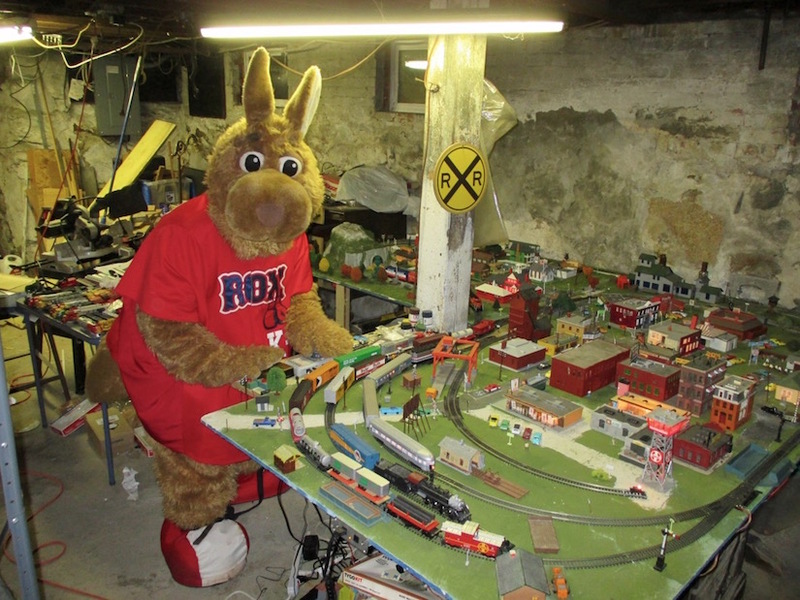 I've even let K-O, the Brockton Rox kangaroo, play with my model train layout! I have that El Capitan. (Who doesn't, right?!?!) Have replaced the trucks and wheel-sets with Tichy's and added knuckle couplers in their own draft boxes. Have plans to turn it into a track cleaning car with a piece of hardboard as the track cleaner. Jim; use un-tempered Masonite. it is more effective. Thank you for the tip Rich. I have always used 'hardboard' interchangeably with 'Masonite'. What I have now to use is the back of a piece of wall paneling. Is this perhaps un-tempered Masonite? If not, what is an example of un-tempered Masonite and where can I find it? Hardboard and Masonite are the same thing. Masonite is just a brand name for hardboard. Both tempered and untempered are available at any building supply store. Comes in 4 x 8 sheets. Just a little too large for a track cleaner. Go to your local lumber yard and see if they've some scrap pieces available. Is there anything I might possibly read, or be directed to, that proves, in some way, that un-tempered Masonite is more effective/efficient, than tempered Masonite in removing track crud? Or is this a matter of opinion? Either way, you are dragging a piece of Masonite below a car. Is the Masonite permeated with some type of (wet) cleaner? (To provide some lubrication?). IMO that’s way more load then I want to apply, you have to admit (after doing the math), that’s a lot of drag. Just trying to find the logic in it all. My personal experience dictates that liquid cleaners (volatile solvents) are the most effective in my application. In a friction application to the track. Go to your local lumber yard and see if they've some scrap pieces available. Thanks for the info Roger but why are you sending me to the store? Did you not read what I wrote above? Info was not directed to anyone in particular just a tip for anyone interested in making a hardboard track cleaner. However, to directly answer one of your questions, you usually can tell the difference between tempered and untempered hardboard by its colour. Tempered is a dark brown colour and untempered is usually a light tan in colour. Tempered will also bend, good for curved backdrops, whereas, untempered will snap. Hmmmn it sure appeared you were responding to me since your post directly followed mine, but I thank you, again. It would appear by what you say, that the pieces of paneling I have are of the un-tempered variety of hardboard. I got a new locomotive this week! An Athearn ready-to-roll Amtrak P42 "Genesis" diesel in Phase III! Today I installed a decoder in it, and it was quite a pain at first; the "dummy" plug was stuck into the DCC harness pretty tight, and then a wire got pulled out by accident and needed to be re-attached, and then a couple of the motor wires got tangled in one of the shafts! But after fixing all that, it runs pretty well now. Parked on my isolated siding is my Mantua Classics BN GP20 locomotive with the TYCO crane car and boom tender. The full Amtrak train, powered by my Amtrak Genesis locomotive. I will say even though the TYCO and Life-Like cars don't look that prototypical, at least having a prototypical locomotive like the Genesis pull the cars looks better than having TYCO's Amtrak F9 or GG1 pulling them! I already have two of the Walthers Cornerstone electrical towers built. I may even string some thread on them to simulate the power lines. Today I bought a Bachmann Deleware & Hudson hopper, an IHC/Mehano Railbox 50-ft boxcar (like TYCO sold in some of their later train sets), and a Walthers Trainline Santa Fe hopper and BNSF wide-vision caboose! Just a couple shots showing my new Bachmann "Train Crew" figures. Bachmann has been making these since 1979. The Walthers Santa Fe hopper. I know AHM and Life-Like also made similar ones in the past. It may not be that prototypical, but I will say it does look cool. Maybe with a bit of weathering it would look even better. Love the traffic signals. The Mehano have filled in step rails? Some more updates, in time for the holidays! And my Christmas train is all set up! Here's a neat sight; my steam-powered Christmas train passes a modern Amtrak train; something you probably wouldn't see in real life! The Amtrak train stopping at the Christmas-decorated train station. A shot of one of the BNSF freight trains waiting for the Christmas train to pass. People waiting at the crossings are definitely surprised to see live reindeer in the stock car! I had asked if your Mehano car had filled in step rails.